You're either into Bézier drawing or you're not, and many CS4 users won't touch Illustrator. This upgrade offers little comfort to vector virgins, but a few new tricks for old-timers. The most obvious is support for multiple artboards. Although this can be used for multipage documents, it's better for including, say, all the elements of a corporate identity in one file. Artboards may be of different sizes, and can be nested to lay out multiple items on a large sheet. 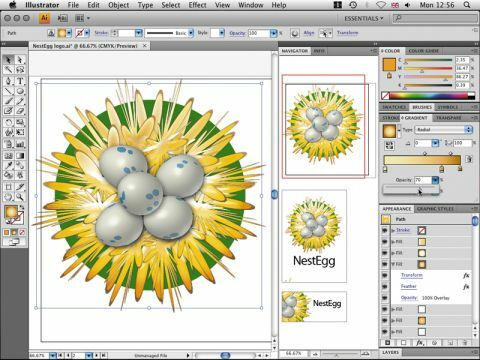 When exporting to PDF, you can create a single file or one for each artboard. This is all good, but Macromedia FreeHand offered multiple pages years ago, before Adobe killed it off. Just as significant is the ability to adjust the transparency of colour stops within a gradient fill. This avoids the need for fiddly workarounds that previously hampered creative effects. The very useful new Blob brush draws a filled vector shape rather than a stroke. The Appearance panel links more attributes directly to panels where you can edit them, and you can apply more than one Graphic Style to each object for complex styling. You can also preview colour separations and overprinting, but honestly this was overdue. There's no Rotate View, though, and when you zoom in to a graphic (the old-fashioned way), Illustrator – unlike InDesign – ignores the current selection, which may go out of view altogether. We didn't see any significant bugs in this version, but performance overall was disappointing, with complex artwork still previewing slowly on a 3GHz Intel iMac. Illustrator is a great drawing program, and arguably the professional choice, but we can't get excited about this upgrade. Still, serious users will want it for multiple artboards and gradient transparency.